Flames engulf the 200-year-old National Museum of Brazil, in Rio de Janeiro, Sunday, Sept. 2, 2018. According to its website, the museum has thousands of items related to the history of Brazil and other countries. The museum is part of the Federal University of Rio de Janeiro. 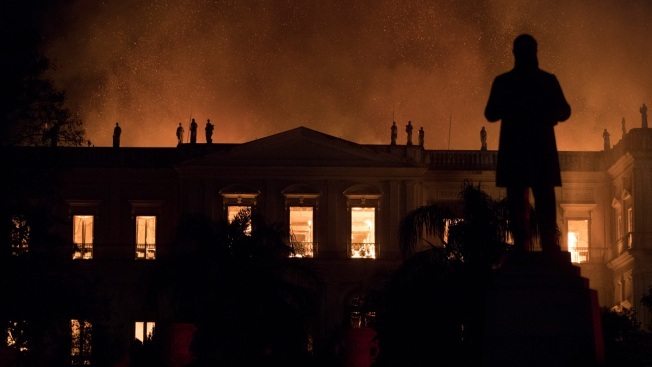 A huge fire engulfed Brazil's 200-year-old National Museum in Rio de Janeiro, lighting up the night sky with towering flames as firefighters and museum workers raced to save historical relics from the blaze. Associated Press video journalist Yesica Fisch and AP reporter Mauricio Savarese contributed to this report.